First off, thank you all SO much for entering this giveaway and posting such amazingly nice things!! I absolutely loved reading each and every entry , and felt giddy with each new comment to read. I would really like to just give a dress to each and every one of you. 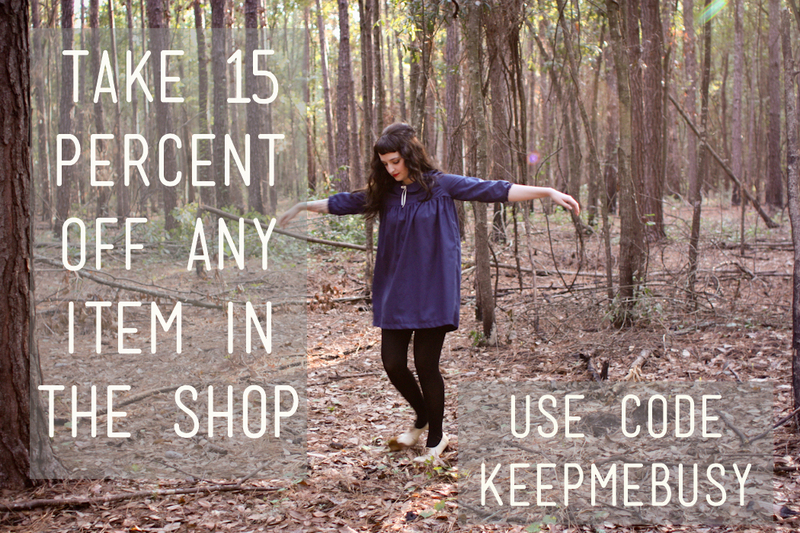 But since that isn't possible I am giving you all a code to use for a discount until this Monday...hooray! Patrick left the other day for a European tour and he will be gone for 3.5 weeks total. I really hate to be missing out on such an amazing trip, but it turns out moving isn't free so I am staying here to make moving money. Living in Portland is the only thing that could keep me away from a trip like this!! So order away and keep me busy for these next three lonely weeks! If you can't tell, Patrick and I do everything together so this is just no fun. But if you live in Europe check out the dates, maybe he will be playing a show near you! You can go and leave messages for him to give me. Oh, and p.s. the winner of the giveaway is.....Lindsi of People Webs! I double and triple checked, because Lindsi is a pal of mine, but she is a friend of random.org's number generator apparently too! So...hooray for dresses!!! Also, please check out Lindsi's shop....she is the absolute queen of crochet, I am envious of her talent. Congrats, Lindsi! You're one lucky girl :) Thanks for having the giveaway. yayyy i still can't believe i won! thank you so much!!!! Congrats to Lindi! I am jealous! Wow, I'm sure the band will miss you while their gone as much as you miss them.